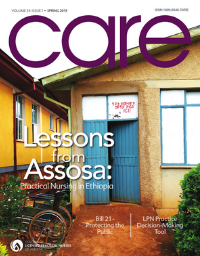 In our feature story, ‘Lessons from Assosa: Practical Nursing in Ethiopia’, a licensed practical nurse writes eloquently about her time in Ethiopia: the challenges, the learning and all that she gained from her experience. Discover more in the Spring issue of the CLPNA’s CARE magazine, sharing healthcare news for and about Alberta’s Licensed Practical Nurses (LPNs). 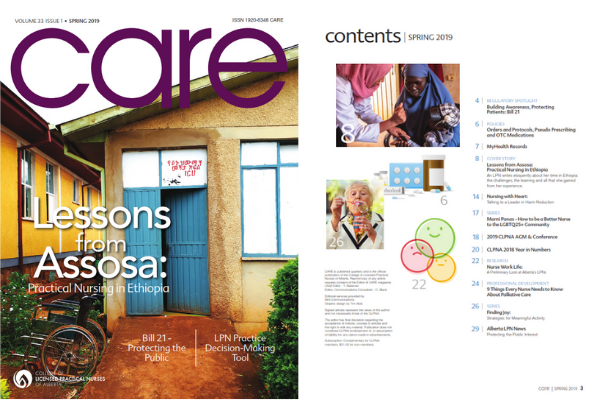 Connect to CARE magazine where it’s convenient for you. Read this issue on your desktop computer, internet-connected smartphone, tablet, or notebook. Click on the mobile-friendly version on Issuu, or download, view or print a PDF copy. CARE is a trusted source of healthcare news for Alberta’s Licensed Practical Nurses (LPNs), with facts on nursing regulation, practice, research and collaboration. You’ll also find valuable and relevant provincial and national nursing news. Published quarterly by the College of Licensed Practical Nurses of Alberta (CLPNA), CARE is distributed to over 17,000 health professionals in Alberta including Licensed Practical Nurses, LPN employers, education facilities, government, stakeholders and Canadian LPN regulators.